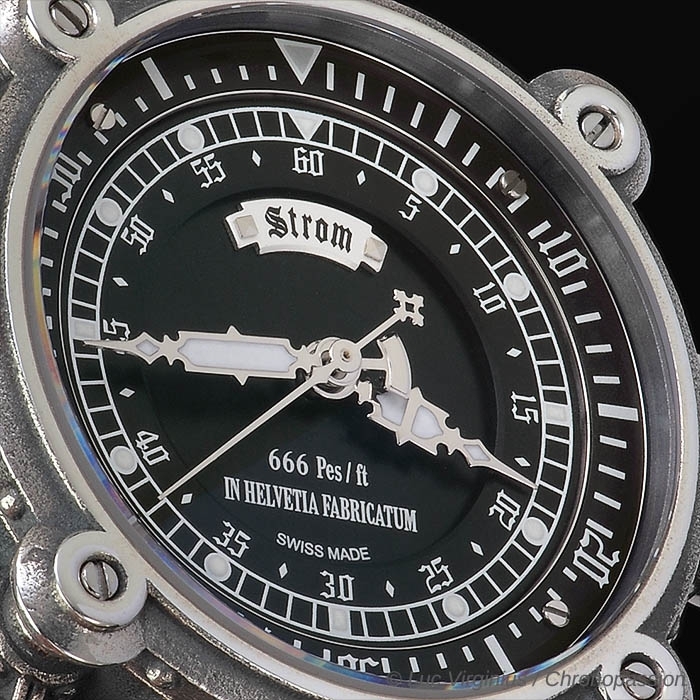 STROM | 12'200 € Tax inc.
Water has always had its divinities: Tlaloc for the Aztecs, Ymir for the Vikings, Poseidon for the Greeks and Nethuns for the Etruscans. All of them reigned over the most fundamental of the four elements. Source of life and purifying symbol across all cultures, water is what connects human beings to the entire living world. Just as the stalks of the giant fennel (ferula communis) served as vessels to carry fire in ancient times, Agonium Nethuns II is an authentic machine for preserving life. 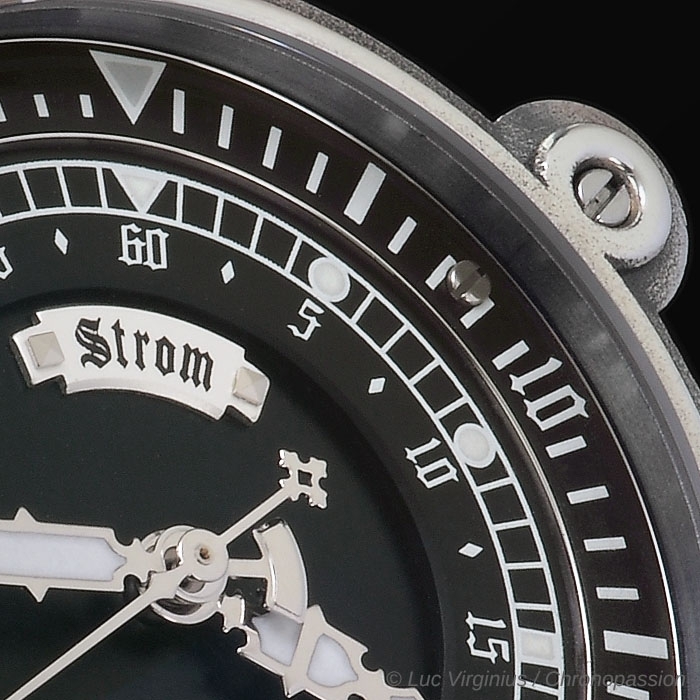 Clad in its imposing bronze or silver ‘shell’ that is water-resistant to 200 metres, the new Strom model is inspired by the world twenty thousand leagues under the sea. 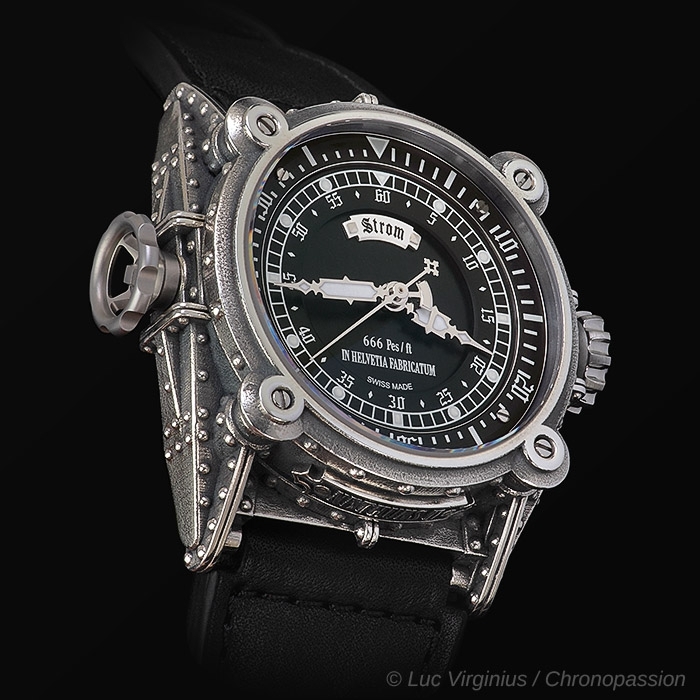 Like something straight out of the wildest childhood dreams and named after the Etruscan ocean god, it evokes both the retro-futurist world of Jules Vernes and the underwater kingdom. Of the four known elements, water is undoubtedly that which most inspires life. In a state of perpetual motion, it flows from springs to streams and from rivers to oceans before returning to the sky and being reborn as rain. A perpetual cycle that has greatly inspired Daniel Strom for the creation of his fifth allegorical universe. 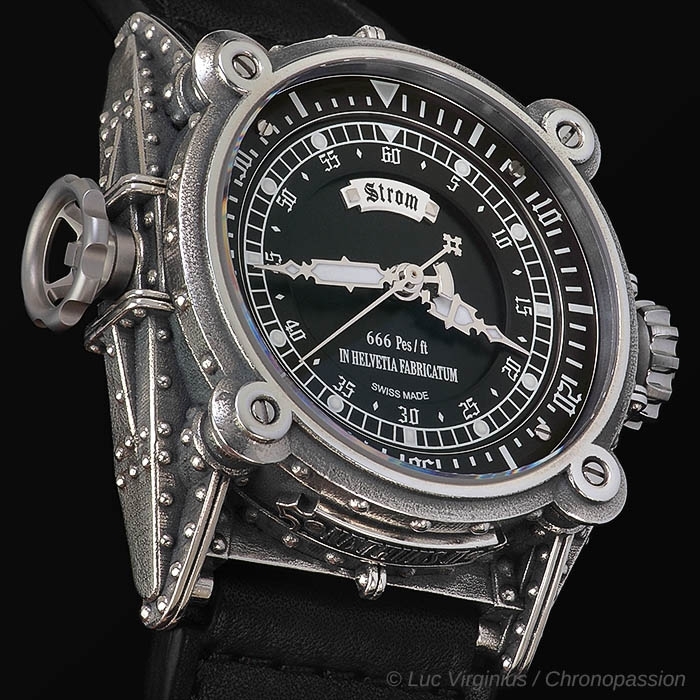 Hand-finished, individually numbered Nethuns II is an authentic diving instrument meeting international water-resistance and safety norms. 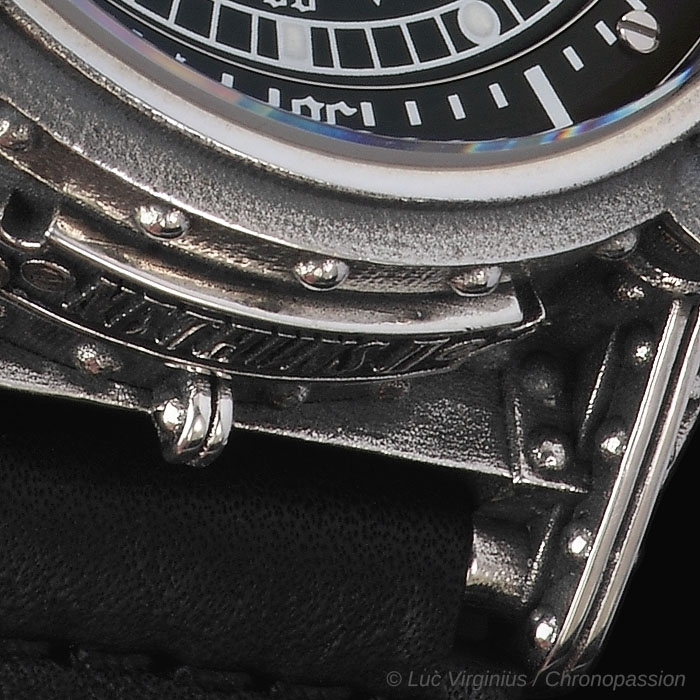 Its unique construction is based on a sculpted additional outer case fitted over a perfectly watertight case. 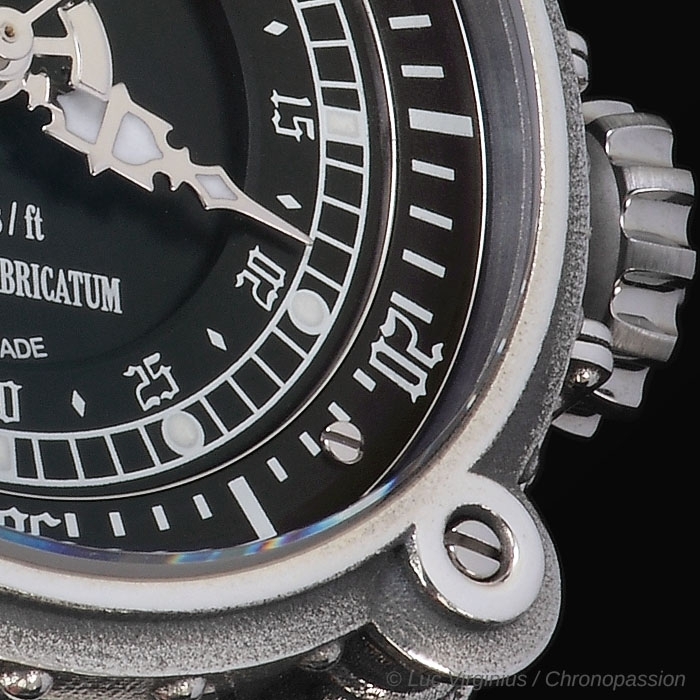 A sturdy screw-locked crown at 9 o’clock serves to adjust an inner diving bezel, offering a particularly sophisticated solution that prevents any inadvertent handling. 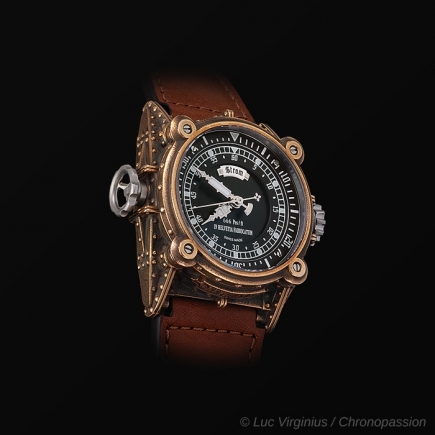 NETHUNS II like every watch in the collection AGONIUM, comprises two cases. 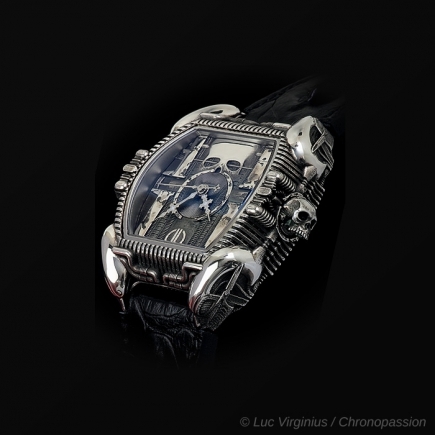 The robust and hermetic inner case houses the movement. 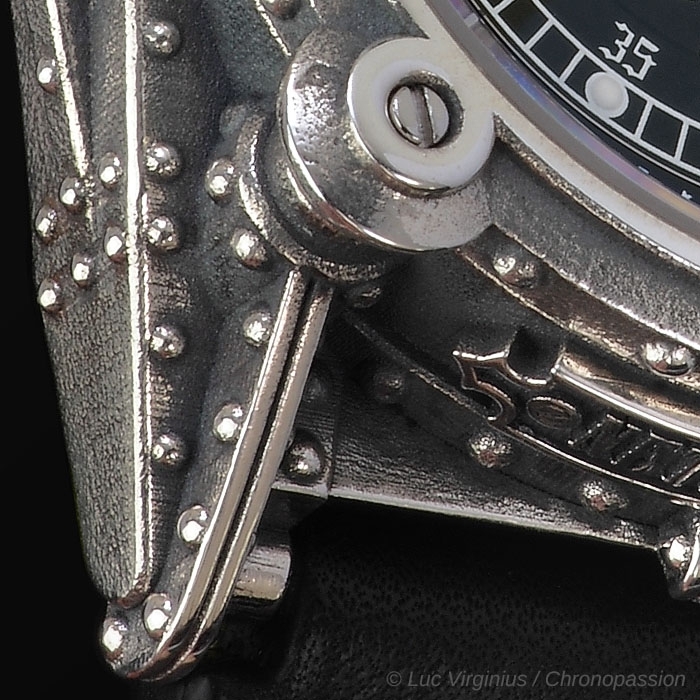 The outer case brings the artistic dimension and gives free rein to the sculptor's talent. 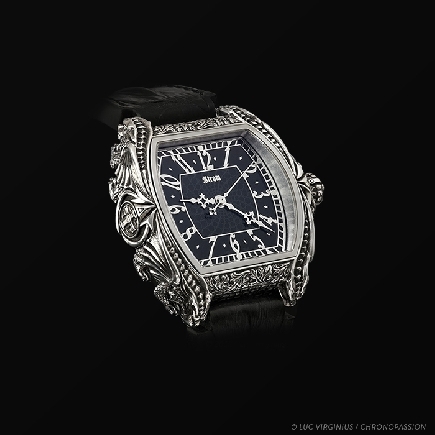 Each one is fashioned by hand, never two the same, with limited editions in each alloy. A sculpture first. A timepiece second. 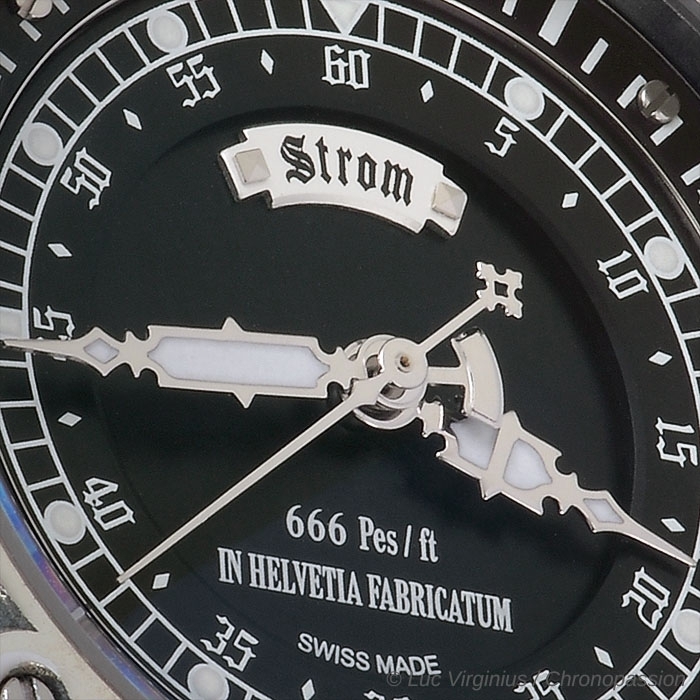 A watchmaker, designer and philosopher, Daniel Strom has constantly questioned the past to enlighten the future. Considering time not as a simple measurement, but as a vital energy, he infuses his creations with a symbolic dimension, consistently highlighting the human condition faced with the eternal nature of life. 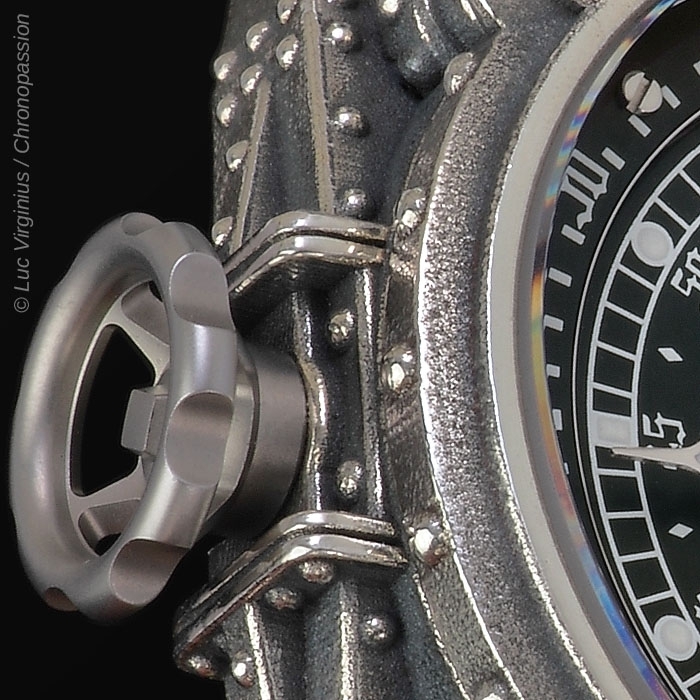 Hours, minutes, seconds, rotating inner bezel operated by the screw-locked crown at 9 o’clock. 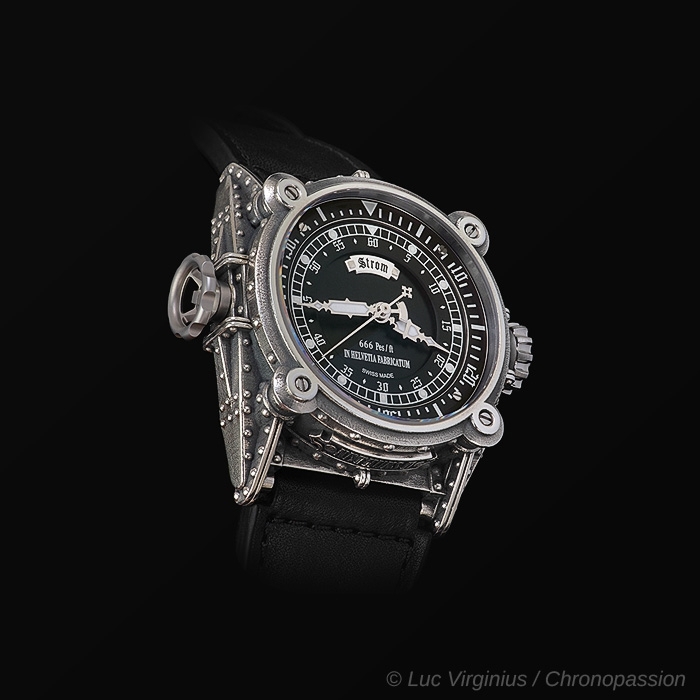 925 solid silver, bronze (CuSn8), palladium or platinum with steel inner case, 48 x 54 mm (without the lugs). Domed glare-resistant sapphire crystal and anti-allergenic titanium curved back. Water-resistant to 200 metres (20 bar/666 ft). Black with white luminescent hour-markers. 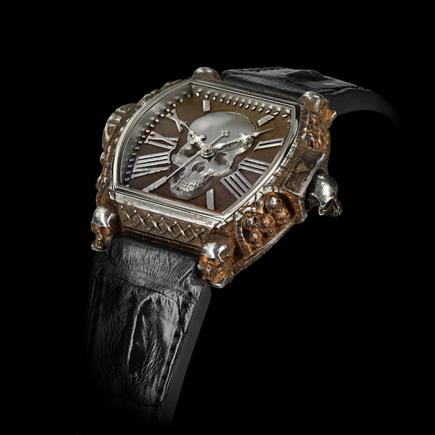 Black or brown leather or rubber, with pin buckle in 925 solid silver, gold, palladium or platinum.